Note that the Big Red Car did not say leadership “versus” management because they are not in a contest with each other. In the startup world, leadership is the rare commodity that propels an organization to a destination it would never find left to its own devices. Leadership speaks in an aspirational language rejecting the notions of limitations imposed by being “normal” or “reasonable.” It is often the only force that is necessary to disrupt years of agreed upon protocol or accepted practice. Said another way, leadership is about vision. It is about doing the right things to transform that vision into reality. In the startup world, management is the glue that transforms a vision into reality through resource allocation. While leadership defines the vision, management marshals the resources that make it happen and disciplines the journey. Leadership does the right things. One is about the destination while the other is all about the journey. Correct, my dear reader. The startup is a wicked cocktail which does not provide the luxury of allowing these two different capabilities and roles to develop independent of each other. They are hopelessly commingled, at first. Once some small growth had occurred and there is critical mass, the roles can be more effectively differentiated. 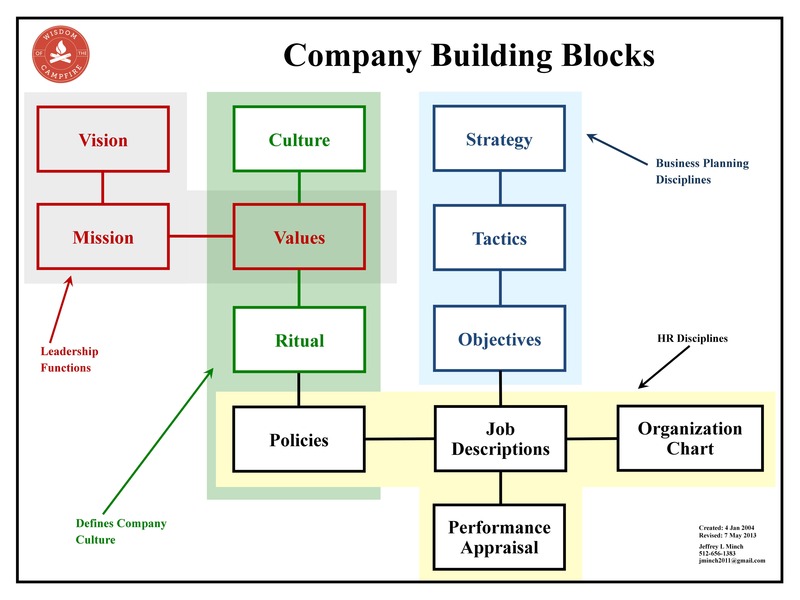 In slightly larger companies, the formulation of the Vision, Mission, Strategy, Tactics, Objectives, Values and Culture provides a clear demarcation line –a fault line, perhaps. Vision, half of Mission, Values and the initial Culture are the exclusive province of the founding leader. Done correctly, this propels the balance of the planning. The other half of Mission, Strategy, Tactics, Objectives and the long term Culture are the province — not exclusive — of management and the team. Click on the above graphic and enlarge it for your use. Organizations require both inspired leadership and gritty management. The destination has to be set and the journey has to be undertaken under control and provisioned correctly. A good leader will also provide the oversight that management needs to blossom much the same way that an effective Board of Directors will keep a founder/CEO between the guardrails at all times. A balance between leadership and management is what creates greatness. While inspiration is for amateurs, it is gritty execution that creates excellence. If you are a leader, you need to ensure that you have a clear Vision, Mission, Strategy, Tactics, Objectives, Values, Culture, business engine canvas, business process graphic, dollar weighted org chart, pitch deck, elevator/taxi/boardroom pitches, a budget and a sense of humor. If you are a manager, you need to ensure that you have your fingerprints on all of those planning documents and that you are allowing — forcing — the organization, the team, to coalesce and align in conformance to those plans. You have to talk to each other while constantly changing hats. But, hey, what the Hell do I really know anyway? I’m just a Big Red Car. Be smart in building your business. Make the power of alignment work for you. You can do it. This entry was posted in Leadership and tagged CEO, founder, leadership, management, startup. Bookmark the permalink. There is a constant unnecessary friction between leadership and management as it impacts the roles of founders and CEOs. Focus on the work product. It will sort itself out if you just focus on the work product.